Although officially 120 was formed towards the end of WW1, it didn’t receive its DH9’s until after the conflict ended and then operated them only briefly on mail flights before being almost immediately disbanded. Therefore, it’s probably more appropriate to consider that 120 Sqn first saw the light of day at RAF Nutts Corner in June 1941. From that point onwards until its eventual disbandment at the end of March 2010, it has the distinction of only ever having operated four-engined aircraft. It sunk more U-boats than any other squadron! That success was undoubtedly due to the dedication, skill and training of its crews but another clue to it can be found in the squadron’s crest. The motto reads “Endurance” which not only applied to its later Shackleton and Nimrod activities but also to the aircraft which it operated throughout WW2 – the Liberator. The Liberator’s endurance was the key. The year 1943 represented the turning point in the Battle of the Atlantic partly because of the closing of ‘The Mid-Atlantic Gap’. Until the appearance of the Liberator a whole swathe of the Atlantic was effectively uncovered giving the U-boast free rein. By 1943 120 Squadron was operating the VLR Liberator V. VLR stood for Very Long Range which was achieved by additional fuel tanks in the bomb-bay and by the removal of much of the armour. A theme which, no doubt, rings bells for many who later operated the Shackleton. The arrival of the Liberator itself was critical but even before its arrival Coastal Command had not been idle. Even if it did not have the aircraft to meet the demands of Anti-Submarine Warfare it had learned a great deal. Eventually Coastal Commands tally matched that of surface ships. But tactics were changing all the time. Among other things it had been learned that the U-boats were at their most vulnerable at night time when they surfaced to re-charge their batteries. The response was the Leigh Light which, in combination with radar could locate a surfaced submarine and then illuminate it. The U-boat’s reply was to fight on the surface and the Liberator’s response was to be fitted with rocket-rails! And so it went on. 120 Sqn sunk its first U-boat, U-597, in October 1942 and its last, U-1017, at the end of April 1945, only a few days before the cessation of hostilities. A brief look at those two successes may illustrate just how effective 120 had become. U-597 had arrived at Brest in August 1942. When it left harbour in the middle of the following month it was on only its second patrol. 120 Sqn sunk it with four depth charges just one month later. It had survived less than a year. U-1017 was on its very first operational patrol when it left Trondheim, Norway on the 14 April 1945. 120 Sqn sunk it SW of Iceland, with four depth charges and a Fido homing torpedo just two weeks later. Seen from the Allied point of view, the Atlantic war was potentially fatal for Britain and until the arrival of Coastal Command Squadrons like 120 the U-boats were winning. What we are slightly less aware of is that the Battle of the Atlantic was also fatal for the majority of U-boat crews. So effective had become the allied tactics that three quarters of them did not return. The majority of Liberators in RAF service were under the US/UK Lease/Lend deal so with the end of the war, nominally, they had to be handed back. In reality most of them were simply melted down. 120 Sqn had already disbanded in June 1945. But in RAF Leuchars was 160 Sqn which had returned to the UK in June 1946 and which still had its Liberators – they must have been ones that the UK had actually paid for - in October 160 was re-numbered and 120 Sqn was resurrected. It continued to operate the Liberator until June 1947. But although the world was changing drastically, life had to go on so 120 Squadron, like many others, re-equipped with the Lancaster GR 3. For 120 life was about to change drastically too and it was sent off to pastures new - the Middle East. Sent to do a job possibly just as difficult as finding U-boats and politically much more fraught. 120 squadron’s job with it’s Lancasters was to locate and prevent illegal immigrants entering what was still known as Palestine. It was a job which the squadron continued on thanklessly until Palestine became Israel and the aircraft and crews returned to the UK in February 1948. Although the Lancaster was a good aircraft, the GR3’s had simply been modified from WW2 bombers and were extremely limited in the available space not just for larger maritime crews but also for the large amount of equipment demanded for maritime operations. But even the Liberator with its much larger fuselage had originally been designed as a long-range bomber. What Coastal Command needed was an aircraft with the space of a Liberator but specifically designed for maritime reconnaissance/bomber operations. What resulted was effectively, the Lancaster successor’s (the Lincoln) wings married to a Liberator fuselage. It was called the Avro Shackleton. 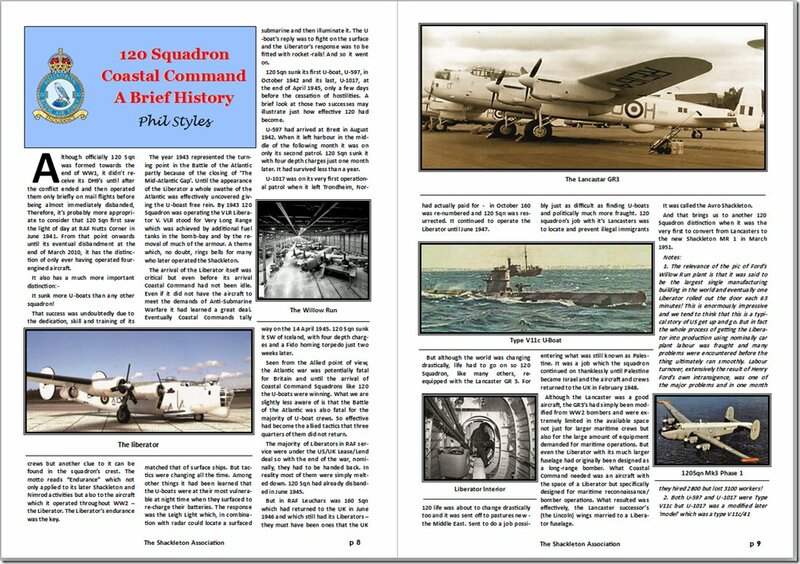 And that brings us to another 120 Squadron distinction when it was the very first to convert from Lancasters to the new Shackleton MR 1 in March 1951.